Grey hair is a sign of wisdom and maturity. But the trouble is if greying happens early in life. While conventional hair dyes can cover the grey hair, they contain many harmful chemicals — which can cause hair loss, more grey hair and even adversely affect your health. Fortunately, nature provides us with simple and safe natural remedies that have been used since ancient times. Looking young and stylish is not a recent thing. Even in olden times, people did care about their appearance. So they took help of various plants and cleverly found ways to keep their hair healthy and vibrant looking. 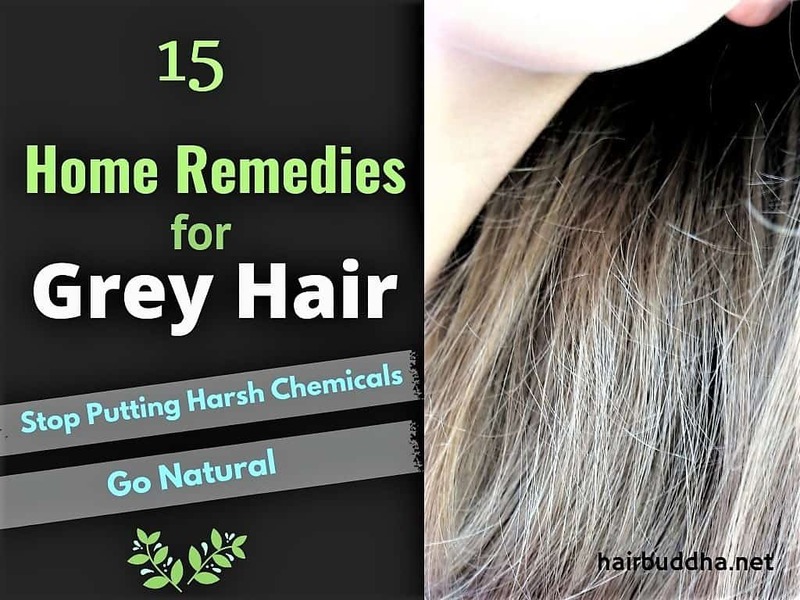 You will be surprised how some common ingredients can work to reduce or even reverse the growth of grey hair. Besides, there are some natural hair dyes, to mask your grey strands, that can create beautiful shades of auburn, red, mahogany, black and blonde. I have written about the causes of grey hair. Research indicates that genetics plays a vital role in greying of hair. But so does stress, poor nutrition and vitamin deficiencies. Thus even if you can’t change your genes, you can certainly postpone greying by living a healthy and happy life. Black strap molasses is a great remedy to halt the growth of grey hair. Some people claim that it helped reverse greying hair and brought back their natural hair color when used regularly. Black strap molasses is a thick dark coloured liquid that is obtained during sugar making process. It is what is left over after the sugar crystals have been removed. But this black liquid is abundant in minerals such as iron, manganese, selenium and copper – the first 3 minerals help to preserve your natural hair colour, while copper helps with the production of hair pigments. It also contains high amounts of calcium and magnesium, which is essential for stronger and healthier hair growth. Black strap molasses has number of health benefits too. It helps with arthritis, improves bone health, stabilises blood sugar levels, combat stress and helps you get clear and glowing skin. How to use: Eat a tablespoon of black strap molasses every alternate day for at least a few months to see positive results. When buying black strap molasses buy one that is obtained from sugar cane juice (not beet sugar) – such this one. Also called as nectar for hair, amla is one of the best remedies to stop the growth of grey hair. It is the richest source of vitamin C and contains array of other powerful antioxidants that help to renew your hair, and make it darker, thicker and fuller looking. Amla also helps to pacify pitta dosha (or excess body heat), which is one of the major cause of early greying. Drinking Fresh amla juice can reverse grey hair and it also great for your skin and overall health. Dried amla powder is equally beneficial and can be consumed with water or added to the smoothie or soups. Massaging your hair with homemade amla oil moisturises and nourishes your scalp and reduces the growth of grey hair. You can also rinse your hair with amla water. It will not only improve the texture and condition of your hair, in few months you will notice a remarkable decrease in grey hair. An onion a day may help keep grey hair away. Onions are rich in antioxidant enzyme catalase, which restores the hair’s natural colour. Besides, the phyto-nutrients in onion along with their vitamin C, folic acid, and copper also help to delay greying of hair. Eating onion is one way you can use its colour reversing power. But, you can also apply onion juice on your scalp to reduce the build-up of hydrogen peroxide and reverse grey hair. In fact, onion juice hair mask has been used since ancient time to remedy grey hair. It even helps with hair loss and makes your hair grow faster, softer and shinier. Just blend a small onion in a blender and strain the juice with a sieve or muslin cloth. Apply this juice to your scalp and let it sit for about 30 minutes, then wash as usual. Repeat twice a week. You can also mix onion juice with equal amounts of coconut oil and follow above instructions. And if onion smell is too strong for you, mix onion juice with 1 egg and 1 tablespoon olive oil and apply. New research suggests that it is not the loss of hair pigments that turns hair grey; it is the build-up of hydrogen peroxide in the hair follicles that literally bleaches the hair inside out. 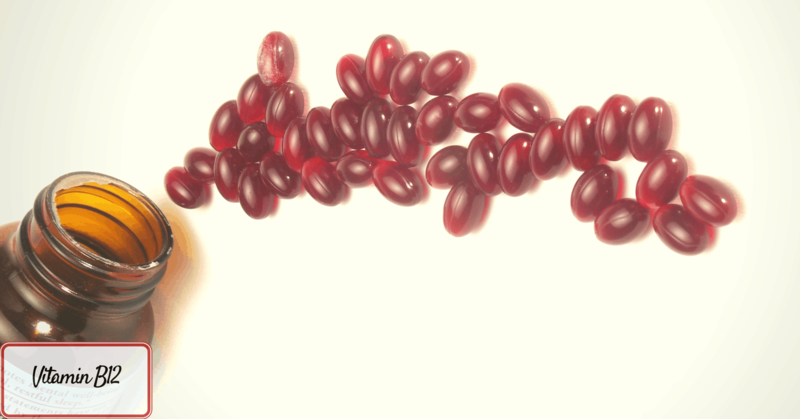 When we are young, our body produces a large amount of an enzyme called catalase – which is a powerful antioxidant. Catalase quickly breaks down the hydrogen peroxide molecule into harmless oxygen and water. But as we age, our bodies produce less catalase. Even factors such as stress and poor diet can cause catalase levels to go down. This causes the build-up of hydrogen peroxide in the hair follicles – which breaks down the hair pigments, as a result the hair turns white. The good news is that several foods contain high levels of enzyme catalase. And eating them regularly will help return your natural hair colour back. Catalase rich foods include: almond, wheat grass, garlic, onion, leeks, cabbage, broccoli, kale, cucumber, collard, turnip greens, carrots, radish, cherry, potatoes, and sweet potato. Wheat grass juice is another fantastic natural remedy to keep the hair form graying. It is packed full of vitamins A, B-complex, C, E, chlorophyll, amino acids, iron, selenium, copper, calcium, iodine and antioxidant enzyme catalase. The extraordinary antioxidants in wheat grass help to get rid of hydrogen peroxide—which causes grey hair and other signs of aging such as wrinkles, age spots, arthritis, and dementia. Wheat grass juice is also useful in skin problems such as eczema and psoriasis. How to use: You can either grow your own wheat grass and juice it or buy ready-made wheatgrass powder and have it with water, or add it to your smoothie or soups. Tip: If you are making fresh juice, extract the juice using a blender or juicer and then store the remaining in ice cube tray. Use one cube at a time. Coconut oil can do wonders for hair – from dandruff to conditioning to hair growth – it can tackle all your hair issues. Coconut oil is also a simple yet effective remedy to keep grey hair at bay. So how does coconut prevent greying? According to ayurveda grey hair is caused due to excess pitta dosha (or high body heat). Coconut oil is one of the best ingredients to pacify pitta dosha, thereby prevents hair turning white. Coconut is rich in antioxidant and other amazing nutrients. 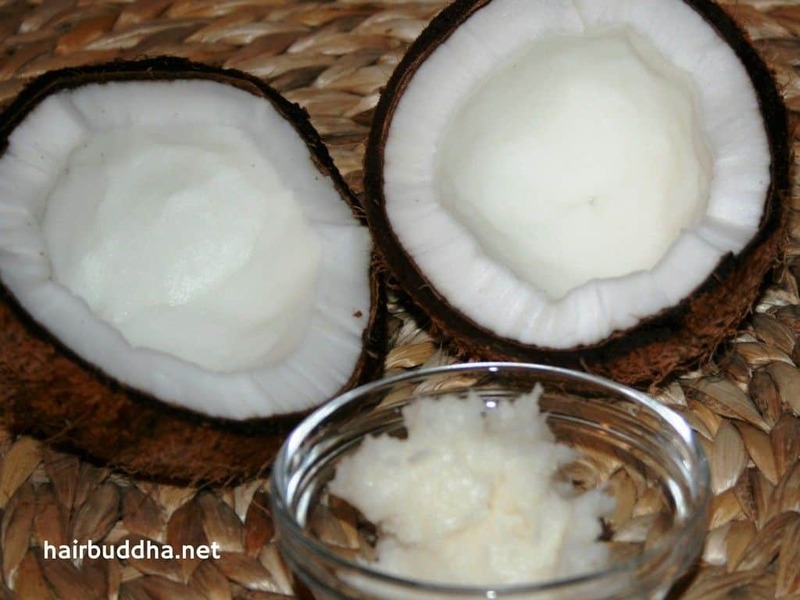 So include coconut oil, coconut milk or coconut meat in your diet to nourish your hair form the inside out. You can use coconut oil for head massage or add it to your homemade hair masks. Add a tablespoon of aloe vera gel for extra boost. Or use coconut oil to make an amla hair oil or curry leaves hair oil to promote pigmentation of hair. Curry leaves is an age-old remedy for grey hair. Anecdotal evidence suggests that people who eat these dark green aromatic leaves daily or apply its oil do not get grey hair early. Curry leaves contain powerful antioxidants including vitamins A, C and E, and minerals such as calcium, phosphorous, iron, magnesium, and copper. Not only does it help to reverse the growth of grey hair, it nourishes and strengthens the hair follicles, to promote healthy hair growth. When used as a hair mask, curry leaves increases body and luster and makes hair silky soft. Curry leaves together with coconut oil works as a great hair tonic. Here’s how to make curry leaves hair oil to reduce greying. You can also apply a hair mask of curry leaves. Make a paste of ¼ cup of curry leaves and mix it with ½ cup of yogurt. Apply to your scalp and hair and leave it on for 30 minutes, then wash off. You can also include fresh or dried curry leaves in your diet. Eating curry leaves also helps to regulate blood sugar levels, lower cholesterol and is also good for eyesight. 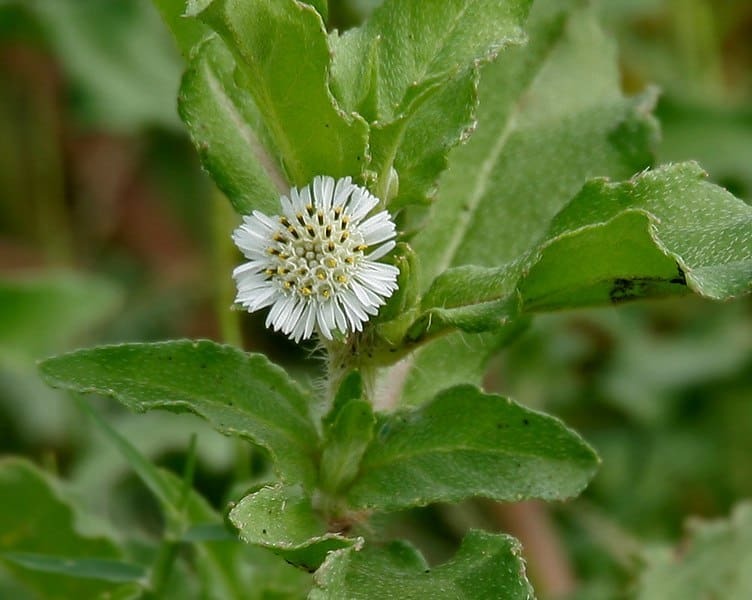 Bhringraj or Eclipta Alba is another fantastic ayurvedic herb for hair loss and premature greying of hair. In Indian tradition, it is considered as the “king of herbs” for hair growth because of its ability to rejuvenate and nourish hair. A regular use of Bhringraj makes hair grow darker and thicker. It also adds shine and softness to your hair. I have seen it myself, one of my relatives used bhringraj powder mixed with coconut oil, brahmi and amla his grey hair reduced remarkably in one years’ time. You can use bhringraj in a hair mask. Mix 1 teaspoon each of bhringraj powder, brahmi powder and amla powder with water to form a paste (you can also use coconut milk or yogurt as the base of the mask). Let it sit for 20 to 30 minutes, then wash as usual. Bhringraj is a great liver tonic, and a healthy liver equals healthy hair. You can take half teaspoon bhringraj powder with ghee or honey or drink it with warm water (Note: Before taking bhringraj powder internally, please consult an ayurvedic doctor). Ashwagandha is an anti-aging herb – it can reverse your greys and keep your skin soft and young looking. This Indian herb has amazing hormone balancing effects, and it also helps to calm the mind and boost your immune system. You can also take ashwagandha in powder form, about ½ teaspoon with milk or ghee. If you see number of grey hair increasing, and you also feel tired all the time, along with shortness of breath, confusion and brain fog, a deficiency in the B12 may be the culprit. Vitamin B12 is present in natural form only in animal sources of food– meat, fish, eggs, milk and other dairy products. So if you are a vegan or a vegetarian you are likely to be deficient. Also certain medicines or medical condition can affect the absorption of vitamin B12 (read here). Hair greying due to B12 deficiency is easily reversed by including including B12 rich foods into your diet. But if you are a vegetarian you can boost B12 in the body by taking a B12 supplement. Buying Tip: Buy natural form of B12, also known as methylcobalamin, as it is easier to absorb and is generally better for your body. In traditional Chinese Medicine black sesame seeds are considered as one of the best foods for hair. Along with nourishing the scalp and stimulating hair growth, black sesame seeds can promote melanocyte activity to produce melanin – the pigment responsible for hair colour. They also have great anti-aging benefits and help to make your skin soft and supple, improve bone health, relieve arthritis pain, boost eye health and promote peaceful sleep. How to use: To naturally cure your grey hair, eat a tablespoon of black sesame seeds 2 to 3 times a week. More health benefits and how to eat here. Henna is a fantastic natural alternative to synthetic hair dyes. It gives the hair a warm reddish-brown colour, and when mixed with other herbs such as coffee, indigo, clove, can create a variety of beautiful shades. Henna is also hair conditioning, it coats the hair with a fine film and adds body shine and brilliant highlights. How to use: Prepare a henna mask by mixing black tea/coffee with henna powder – it should be yogurt consistency. Cover the bowl and let it sit for 3-6 hours. Just before applying add 1-2 tablespoons of olive oil. Apply it to your hair, leave it on for one to three hours, and then rinse it off. Indigo is a great natural dye to colour your hair brown or black. It is obtained from Indigofera tinctoria leaves and was used to colour fabrics such as cotton and silk in olden times. You can use this dye to cover your greys without having to worry about its side effects, as there are none. For blackish colour, first henna dye your hair. Next mix indigo powder with some warm water and a pinch of salt, let it sit for 15-20 minutes for the dye to release. Then apply on your hair and let it sit for 1-2 hours before washing it off. This is a two-step process, takes a little while, but the outcome is superb. There is a short cut to get a brownish colour. First, prepare the henna and let it rest for a few hours. Next prepare the indigo just 10-15 minutes before applying (see above). Mix the henna and indigo together and apply on your hair, leave it on for 2-3 hours and wash thoroughly. You can buy indigo powder online or at a health store. Rosemary not just adds amazing flavour to your dishes; this aromatic herb has been traditionally known to darken gray and also slow the appearance of grey hairs. And if you have premature greying along with hair loss then rosemary is a must-try herb for you. The stimulating properties of rosemary encourage new growth, while its high antioxidant content gets rid of free radicals that damage hair pigments. Rosemary also revitalizes hair, removes product/cal build up to leave your hair shiny and soft. Plus, it is super-effective against dandruff, scalp irritation and itching. You can apply rosemary hair rinse to darken your hair. Add sage leaves for extra effect, here’s an easy way to do it. Rosemary infused hair oil can also be applied directly in the hair. To make this oil, take a glass jar, fill 1/3 of it with dried rosemary. Then fill it completely with extra virgin olive oil. Place the jar in sunny location and let it steep for 3 to 6 weeks. Gently shake the jar every 4 days or so. Once the oil is done infusing strain and store in cool dry place. There are more herb options to colour your hair. You won’t get a dramatic change with one application. The results are subtle and the colour will gradually build up in your hair so you will have to repeat them a few times before you see any change. Red hair: Carrots juice, Beet juice, Marigold flower, Rooibos, Hibiscus flower, Rose petals. Chamomile flower tea makes a fantastic hair colorant for blonde hair. Chamomile contains a special pigment called apigenin, which gives hair a golden tint. Chamomile is also a soothing hair tonic and natural remedy for scalp dryness and dandruff. Bring water to a boil, add chamomile flower, reduce the flame and simmer for 10 to 15 minutes. Remove from the heat and let it steep (covered) until cool. Strain and use. To use, pour on your hair and let it sit for 10 to 20 minutes, then wash off. You can also leave it on and let your hair dry naturally. Repeat twice a week for best results. Increase your intake of fresh fruits and vegetables — they are high in antioxidants and help prevent grey hair. Reduce your intake of caffeine, junk food, and alcohol. Avoid washing your hair with hot water. Use lukewarm. Stay away from harsh chemical and avoid treatments such as permanent straightening. Cover your hair with a scarf or hat while going out in hot sun. Massage the scalp of hair with fingertips to increase blood flow to the hair follicles. Hi Diya, Did you try to apply Indigo with Henna or separately? Kindly advise. I appreciate all the advice helping to repair and aid hair growth. Is there any side effects in consuming Black Strap molasses and has have u seen any positive results after consuming? Hi Deepthi, I am glad you found this article useful. You can add 25 to 40% indigo. Add indigo in the end, just 10 to 15 minutes before applying it. Activate indigo by mixing a pinch or two of salt and let it sit for 10 minutes. Then mix it with the rest of the henna and apply on your hair. Let me know how it works for you. You won’t get it in one go you will have to repeat every week. Or you can do two step process: first apply henna, wash, then apply indigo. How to effectively prevent pre mature hair greying? From my experience the best way to save hair from graying is to apply a mixture of lemon juice and coconut oil, but these home remedies look great and I’m pretty eager to try them out and see the result compared to my standard method. I have heard it before as well that Amla and wheat grass can reverse grey hair. I will give it a try & report back. anyone else tried it?